Our website address is: http://harrow-apollo-male-choir.org. The website is hosted by Flywheel Word Press Hosting and Management and our domain name is hosted by Cue Media Solutions Ltd. 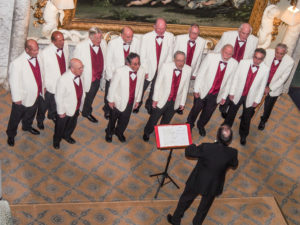 The Harrow Apollo Male Choir (HAMC) is a small not for profit organisation and charity registered with the Charity Commission for England and Wales (Registered Charity No 1117134). The study and practice of Choral music in order to foster public knowledge and appreciation of such music by means of public performance. To assist and support such charitable institutions or purposes as the Committee shall from time to time determine. HAMC benefits a range of other charitable organisations by performing fundraising concerts and other fundraising activities. HAMC does not collect personal information that it does not need. This website does not ask people to login, register or provide their personal details for that reason. When you visit most websites, the web browsers and servers that you use will typically make some information available, such as browser type, language preference referring site and the date and time of each visitor request. You cannot be personally identified from this information. HAMC’s purpose in collecting this non-personally identifying information is to lead to better understanding of how our visitors use HAMC’s website. HAMC may publish this type of information as cumulative data for example by publishing a report on trends in the usage of its website. HAMC’s website also collects information that could potentially identify you, like Internet Protocol (IP) addresses. This is so that, for example, members can browse the members’ pages without needing to input a password every time they visit. Personally-identifying information, such as your name, email address etc. will only be collected if/when you choose to directly interact with HAMC’s website by leaving a comment on one or more of our blogs or if you contact us directly using the contact form, by emailing, telephoning, requesting a newsletter or by any other direct means. The amount and type of personal information that HAMC collects depends on how you interact with us. See specific details below. The website has two contact forms, one for general enquiries and one to request our latest newsletter. Both ask for your email address so that we can respond to your enquiry/request. The enquiry form also asks for your first and last name and provides a space for your message. Both types of messages are sent via Word Press to our dedicated email addresses: contact.harrowAMC@gmail.com (for general enquires) and newsletter.harrowAMC@gmail.com (for newsletters). Our website administrator deals directly with both these types of enquiries. Your email may be forwarded to the relevant choir officer, when necessary e.g. if requesting a performance this would be sent to the Concert Manager; if enquiring about becoming a member, this would be sent to either the membership secretary and/or our recruitment manager etc. Your personal details are not publicly visible and will only be shared with the relevant choir officers. HAMC does not sell personal information to any third parties and would only pass on information, when relevant and only with your express written permission, unless legally required to do so. There are 6 email addresses listed on HAMC’s website Contact Us page and these will put you directly in touch with the relevant choir officer. Your personal information will be treated securely by any of these officers in the same way as outlined in section 2.3 above. Only information that is necessary to fulfil your request or respond to your enquiry will be requested. These are “official” HAMC addresses however, emails from them may be forwarded to personal email accounts of the relevant choir officers, where these individuals have requested that set up. Any Choir Officer responding from a personal address makes the choice to share that email address with the recipient(s) but are still expected to follow HAMC data protection policies and protocols when sending any email on the organisation’s behalf. Any officer, without an official email address may ask an officer, who does have one (most likely the website administrator), to send an email on their behalf. There are two contact numbers listed on the website. These are the personal numbers of the officers concerned, who have given their permission for this personal information to be published. Currently, HAMC does not have an official telephone number to publish. A cookie is a name for a small file which is downloaded onto an electronic device when you visit a website. The cookie lets the website recognise your device, so the site works more effectively. HAMC may collect statistics about the behaviour of visitors to its website. HAMC may make this information public or share it with specific interested parties. However, in doing this HAMC does not include or share any personal information. ii) that have agreed not to disclose it to others. Some of those office holders, service providers/contractors or affiliated organisations may be located outside your home country, by using HAMC’s website, you consent to the transfer of such information to them. HAMC will not rent or sell potentially personally-identifying or personally identifying information to anyone. Other than sharing this information with choir officers, service providers/contractor and affiliated organisation as described above, HAMC only shares this information if legally required to do so. HAMC offers you the opportunity to interact with our website and post comments on our blog posts to let us know your opinions. If you choose to leave a comment using the form on our blogs, you are asked to give your name and email address and, if you wish, a URL address linking to your own website. Only your name, and profile picture, if you have one, will be displayed on the site above your comment. Your email address is only visible to our Website administrator in the password protected administration area of the site. The reason we ask for your email address is that it helps us to identify genuine comments from spam. Also so that we can contact you, in the unlikely event that it is necessary to respond directly to you about your comment. HAMC will not use your email address to contact you for any other purpose, unless you have given your express written permission for us to do so. Comments posted on our blogs are approved by the HAMC Website administrator to ensure that they are not spam and are not abusive or from non-approved advertisers. If a URL is provided, every effort will be made to check that the webpage or site this links to is compatible with the HAMC’s ethos and is not unrelated advertising or marketing material. However, HAMC cannot be held responsible for the content of any external websites that it provides links to. HAMC’s website does not publish online adverts. It does promote its own events and those of other local choirs, music associations or other relevant individuals/groups through blogs and other information provided on its webpages. Biographical details of individual members of the Music team are published on the public area of the site and are provided by the individual concerned for this purpose in the full knowledge that this will be available to any member of the public visiting the website. Names of Choir Officers and those with specific responsibilities are published on the website. Those concerned have given written permission and have been informed that this information will be available to any member of the public visiting the website. If you contact us directly by email, telephone, text etc. we may ask you for personal information so that we can fulfil your request. In these cases, we will keep your information for as long as we need, to deal with your request, or for longer with your permission. Flywheel is an international company based in the UK, throughout Europe and other countries around the world. It is therefore, subject to European data protection law that requires data about European residents which is transferred outside the European Union to be safeguarded to the same standards as if the data was in Europe.